← Where has Pam been? Pam’s Pictorama Photo Post: I don’t have all that much to say except that I fell in LOVE with this postcard when I saw it a few weeks ago. I will confess that I paid dearly for it (which just shows that other people saw his charm as well), but the pain of purchase is already fading in my memory – my pleasure with the card rapidly eclipsing the cost. 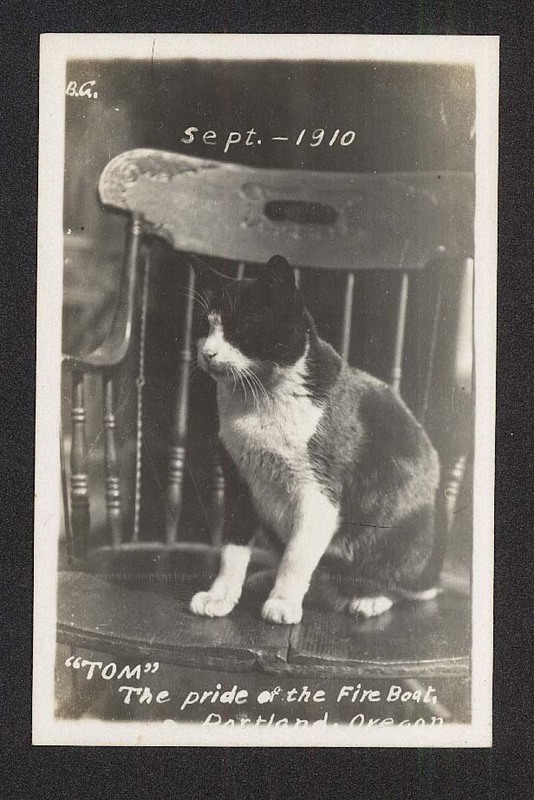 September 1910, more than a hundred years ago this month, Tom, The pride of the Fire Boat, Portland, Oregon, posed for this photo. (Yep, another wonderful photo find from the great city of Portland, OR.) What a nice fellow! He has a great sense of readiness about him and it is easy to imagine him helping with all the necessary boat tasks. A very solid little citizen, nicely well-fed, muscular, but not quite fat. And he just about qualifies as a tuxedo – I have a soft spot for those, as many of you know. I salute Tom and I hope you enjoy him too.